Lie-Nielsen Hand Tool Giveaway Winner Announced! Our sincere thanks to all of you who entered our Lie-Nielsen hand tool giveaway that just ended. More than 500,000 entries were submitted through Dec. 31, 2010. Congratulations to Chris Benner of Lebanon, Ohio, the lucky winner of the five Lie-Nielsen hand planes and set of 5 Lie-Nielsen bevel-edge chisels. 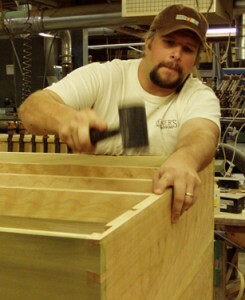 Chris is the proprietor of Benner’s Woodworking, a business that he started with his brother in their parents’ basement back in 1991, handcrafting 18th and 19th century furniture reproductions. The business has grown a lot since then, yet he still employs many of the traditional woodworking methods that were in use 200 years ago. Chris’ response when he received notice that he’d won was an excited “Wahoo!” He says his new Lie-Nielsen planes and chisels will get daily use in his workshop. Highland Woodworking’s next online giveaway features the all new Festool Rotex sander as well as a Festool CT26E dust extractor system – details will be posted on our website and on this blog at the beginning of February – make sure to check back! The Stanley Sweetheart Hand Tool Giveaway: Interview with the Winner! 2012 Lie-Nielsen Giveaway: Interview with the Winner!